Our interactive activities and presentations generally last one hour, but can be adjusted as necessary. We believe that environmental education is an essential part of connecting people to the natural world. Our goals are to facilitate learning that is interactive and provide information that equips people with practical ways to engage in our community and care for the world around us. 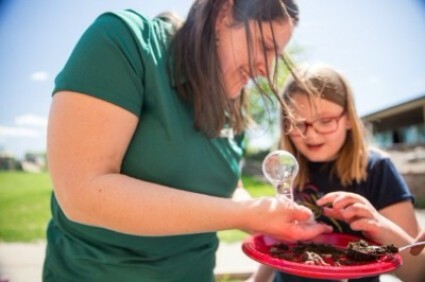 As part of our commitment to educating people about issues connected to environmental stewardship, we conduct hands-on activities and presentations at no charge to schools and community groups. Our educational activities and presentations are designed to integrate with an organization/teacher’s current curriculum. All of our sessions are aligned to Nebraska Academic Content Standards. They are adapted to the age of the group and can be tailored to various subjects such as science, art, literature, math, and the social or physical sciences. We can also incorporate service-learning elements. Daily Environmental Stewardship (recommended for all academic levels) -- An in-depth exploration of waste reduction, recycling, and composting. Students dive deep into how to live a sustainable lifestyle and learn about simple daily actions that have a positive environmental impact. Learning from Nature's Recyclers (recommended for grades K-6) -- A hands-on investigation of decomposer organisms to explore how nature organically reuses and recycles. Students gain an understanding of how to apply these ideas to their daily lives. Classroom Checkout Kit (Worm Compost in the Classroom) -- Expand the impact of the educational session by checking out a vermicompost (worm compost) bin for your classroom. This checkout kit includes everything you need to teach additional activities about decomposers in the food web and waste reduction through composting, including lesson plans! Kit is available for a 3-week checkout period. Trash to Treasure (recommended for grades 5 and up) -- Through this multi-session activity, students discover how to reduce their waste and lead more sutainable lives. Students will also get creative and transform waste materials into fun and useful items. Only Rain Down the Storm Drain (recommended for grades 2 and up) -- Students gain an understanding of how humans impact water quality, the benefits of stormwater management, and how to help prevent water pollution. Healthy Trees and Pesky Pests (recommended for grades 5 and up) -- Healthy trees are an essential part of our urban ecosystem. Students explore the benefits of trees, the challenges they face (such as diseases and invasive pests), and how to care for them. Although we accommodate as many groups as we can, our schedule does fill up each season. Preference is given to classrooms participating in service-learning projects and multi-visit activities linked directly to your classroom curriculum. Outreach programs must be booked at least 2 weeks in advance. Don't see what you're looking for but interested in Keep Omaha Beautiful's education and outreach activities? Send us a message, we can easily tailor activities to fit your needs! Complete a Registration Request Form, call 402-546-3610 or email Hannah.Rennard-Ganley@cityofomaha.org for more information. Take environmental education a step further by integrating a volunteer opportunity. 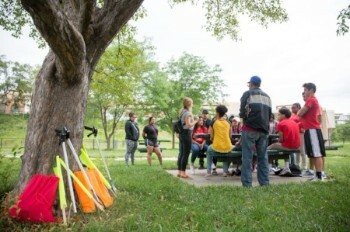 Litter Cleanups (parks, streams, trails, nieghborhoods, and school grounds) - Groups remove litter and recyclable items from selected areas and discuss the importance of keeping our ecosystems clean and healthy. Cleanup events also provide opportunities to analyze the waste collected and discuss questions connected to materials management. Storm Drain Labeling - Groups help remove debris from storm inlets in a designated neighborhood, place “no dumping” discs on the storm drains, and distribute educational doorhangers to nearby homes. Information on water pollution prevention and the importance of managing stormwater are tied into the labeling events. Sustainable Beautification - Groups plant trees and maintain native plant gardens in public spaces. Sustainable beautification events also provide opportunities to understand the purpose of planting native plants, the interrelationships of pollinators and plants, and the benefits of biodiversity. This activity is only available on a limited basis. Ready for a Keep Omaha Beautiful outreach activity? Complete a Registration Request Form. Call 402-546-3610 or email Hannah.Rennard-Ganley@cityofomaha.org for more information. Interested in additional resources connected to environmental education? Check out our RESOURCES section.